In 1990 in ARGENTINA, the state-owned company AGUA Y ENERGIA ELECTRICA (Water and Electric Power) with a loan from Banco Interamericano de Desarrollo, asked SISTRAY Consulting Consortium the design and the elaboration of the bidding conditions of EHVL 500 kV – Rincon de Santa Maria – Resistencia. As part of this Consulting Consortium, COINTEC had as the exclusive task of designing Rio Parana’s waterway crossing on Cerrito Island’s area. In its design, besides coordinating hydraulic studies on undermining, considerations have been made on failure sequence and wire, towers, foundations and clamps probabilistic design. 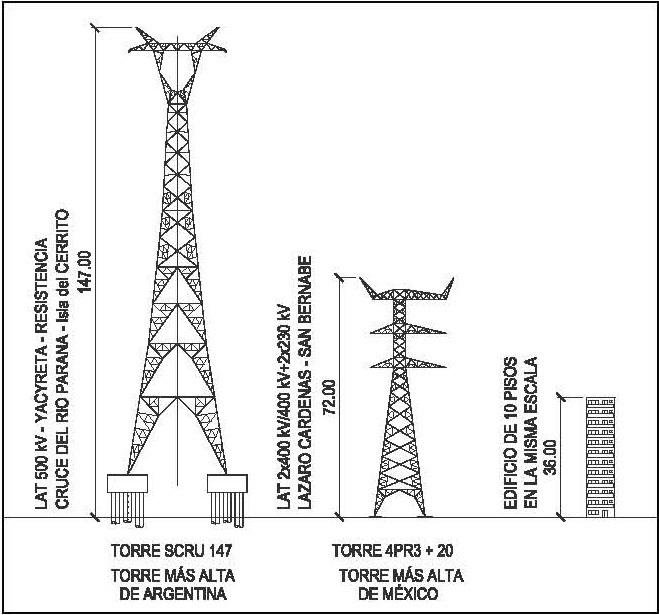 This crossing has a waterway opening of approximately 1100 m resolved with two suspension crossing towers of 147 m height founded over pile heads of 1.20 m diameter and 45 m long, constituting the highest prairie crossing towers in Argentina.